Because a hand-rolled cigar is made of pure tobacco, with no chemicals to make it burn, if not puffed and supplied with air, it will eventually go out. 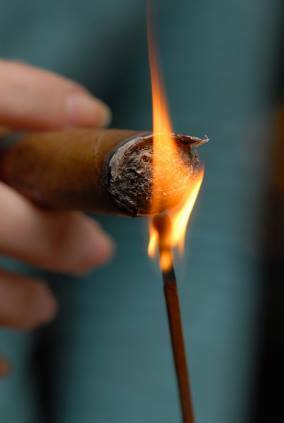 If you try to draw on your cigar and only get a tiny waft of smoke, simply dislodge the ash and relight it. Your best bet is in relighting a cigar while it is still warm. Some people will tell you that you can relight a cigar that has gone cold. Even if you cut the cigar and remove the ash, there will still be smoke or ash in the barrel (the body of the cigar) which will taint the taste of the tobacco. It’s better to light up a new cigar.